Separate Blogroll Title and Description? I’d like to separate my Blogroll Title (the bit with the link in it), from the Description text. At the moment they appear as one line, wrapping if needed onto two rows. This is usual behaviour. But to my mind doesn’t look right. I’d like to have the Description on a separate line beneath the Title. Can someone help me with the code I need to add to my child theme to achieve this please? Ideally I’d want the description is slightly small text as well, but I’m sure I can manage this if I can separate the lines. Here’s an image to show what I mean. Can you post a link to the site where Blogroll widget is activated? Could you explain (without wasting too much of your time) how that works? I’d like to be able to change the properties of the description text (size, weight, color, etc.) but without knowing this I may struggle. linkcat-2 is the ID of your Blogroll widget. So, first we target that widget (#linkcat-2). 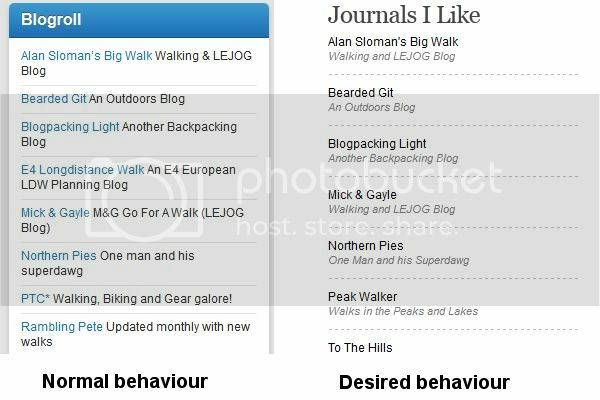 Each Blog item in the widget is listed (unordered list – ul li ). Link (ul li a) in the list was displaying inline. We changed it to be displayed block. So, it spanned the whole line and pushed the description to the next line. Hmm.. I’m not good at explaining things.. ..
That’s just fine, thanks for your help.